Many different varieties of lemons are grown all over the world. However, the true lemon is believed to have originated in India, from where it spread to the Mediterranean, to be later brought to the Americas by Christopher Columbus. While lemons can be grown in almost any soil, they are one of the most cold-sensitive citrus fruits, which limits their cultivation to warm areas. Lemon trees are nice looking perennials, fairly easy to grow and maintain. However, they are sensible to low temperatures and do better in warm climate conditions. These easy growing guidelines will help you to successfully cultivate and enjoy your own lemon trees in a garden or backyard. The lemon tree is known for being highly tolerant to poor soils. In fact, in some parts to the world, lemon is successfully grown in sandy soils. Lemon prefers well-drained, moist soil that has a neutral to slightly acidic pH. Choose a planting site that is in full sun, away from other trees and structures, and free of puddles after rains. Moreover, the site should have good air circulation but be protected from cold winds. Before planting lemon, sod should be removed from the area. The future lemon tree should be planted in a hole that is at least twice as wide and twice as deep as the rootstock. Because lemon does well in poor ground, it is not necessary to amend the soil before planting. Instead, the hole can be simply backfilled with the loosened soil that was previously removed, which will help the lemon tree's roots to spread. Lemons can be propagated from both seeds and rootstocks; however, while lemon rootstocks can be planted them directly into the prepared spot, seeds need an indoor period for proper germination. When planting lemon rootstocks, the topsoil should be leveled with or slightly above the surrounding area. The hole around the rootstock should be carefully filled, and the soil gently tamped down to remove air pockets. The plant must be watered immediately after planting. During the winter months, it is recommended to apply cold protection measures to protect the lemon tree. Soil banks are recommended for young trees. They should be built up around the end of November to be removed at the end of February. Alternatively, blankets, tarps, or other covers can be used to protect the tree from cold. Before starting lemon from seeds, it is important to know that the presence of sugar will encourage fungus, which can kill the seedlings. Any trace of sugar should be removed by thoroughly washing the seeds, and they should be planted immediately after being extracted from the fruit, since lemon pits do not tolerate drying like other garden seeds. Lemon seeds must be planted in a well-drained pot, approximately one-half inch (4 cm) deep into the potting soil, which needs to be slightly moistened afterwards, before covering the top with plastic wrap to reduce evaporation. As the soil begins to dry, it is important to water it a little, making sure the it does not become soggy. The pot must be kept in a warm location, such as the top of a refrigerator, until the seeds germinate. For this first period light is not necessary, but once the seedlings begin to appear, they will need light. Direct sunlight is not required, but bright light is necessary. As other acid citrus species, lemons are easy to grow in containers inside and many will bear several crops of fruit per year if given optimum growing conditions. 'Meyer' lemon trees are a great option for growing indoors, since they are small, with few thorns, very fruitful, and long-lived. In order to grow a lemon tree indoors, it is necessary to fill a container of at least 14 inches (36 cm) in diameter, with a loose, well-drained potting mix maintained at a 5.5-6.5 pH. It is important to ensure that the container has drainage holes at the bottom. Lemons need plenty of sunlight and a warm environment to thrive, so the seedlings should be placed in a room kept at 55-68°F (13-20°C), where they can receive at least eight hours of light per day. Since citrus trees also require about 30-60% of humidity, and most homes provide only 15-20%, a cool mist vaporizer or humidifier may be used to create proper conditions. Alternatively, placing the container on a pebble tray that is partially filled with water and misting of the foliage frequently helps raise the humidity. A soluble citrus fertilizer that is formulated to maintain the medium at a slightly acidic pH may be applied about once a month, or a slow-release fertilizer can be pre-mixed into the potting medium. Lemon trees should be watered when the top two to three inches of the potting medium feels dry. Over-watering is a common cause of fruit drop. The irrigation of lemon tree should be carefully controlled. Lemon does well with plenty of water during the flowering and fruit development seasons, but over watering can lead to diseases. It is recommended to water a newly-planted lemon tree every-other day for the first week, then once or twice a week for the next three months. If you experience a prolonged period of little to no rainfall, water your young lemon tree periodically. Once your lemon tree is well established and mature, it will not need to be watered frequently. 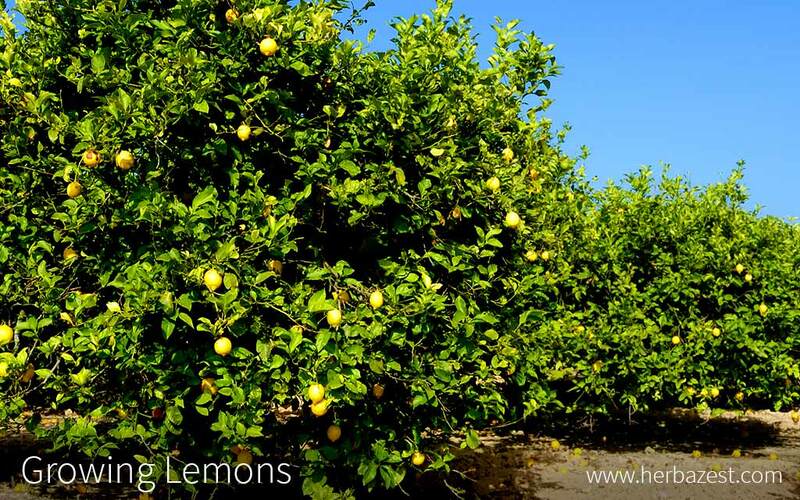 Although lemon trees thrive in poor soil, the first year after planting they can be fertilized with one cup of ammonium sulfate split into three or four applications. This amount can be increased by one cup every year. The fertilizer must be spread on the soil surrounding the lemon tree right before watering. In some regions of the world, the area around the base of the lemon tree is mulched in order to conserve moisture and prevent the growth of weeds. However, this is not recommended as it increases the likeliness of the tree experiencing foot rot. In case of using mulch, it is advised to apply it around the base of the lemon tree, at least one foot away from the trunk. The pests that damage lemon trees vary depending on the region. In Southeast Asia, ants commonly attack the root systems of lemon trees, and farmers will have to flood the beds and burn the ants off the surface. In California, it is often necessary to protect young lemon trees from rabbits and arthropod pests, such as the California red scale (Aonidiella aurantii), which requires the application of pesticides. In Florida, the major lemon pests include rust mites, purple mites, and purple scale. However, all of these pests can be easily controlled with the use of appropriate pesticides. In Florida, lemon trees are prone to scab and anthracnose. Moreover, lemon trees may be affected by stem-end rot, damping off, and different varieties of leaf spot. Around the world, lemon trees are often affected by red algae, causing the dead of foliage and branches. In order to control red algae, it is necessary to apply a copper fungicide. The lemon fruit should be harvested when it is still green and approximately 2 inches (1 cm) in diameter. After harvest, the green fruit should be allowed to cure at room temperature until it slowly becomes yellow, the peel becomes smoother and thinner, and the juice content increases. Ripened lemons should be stored in polyethylene bags in the refrigerator. Under those conditions, lemons can last for up to a week.